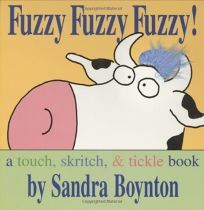 Sandra Boynton's personable animals teach youngsters about textures as they beg to be touched in Fuzzy Fuzzy Fuzzy! A Touch, Skritch & Tickle Book. From a cow with tufty blue hair and a velvety pink nose, to a pig with shiny green sunglasses and a dog with ""Rough/ rough/ rough"" paw pads, these animals combine classic Boynton charm with a large touch-and-feel format.